OWNER OF ADWORKS, WOODSTOCK PROPERTIES, & is self employed. Come enjoy Woodstock and stay 3 minutes from town totally secluded w/ mountain views, in ground pool, and gorgeous views. Peaceful and serene, romantic, yet close to everything without the noise and hustle of town. We pride ourselves on making our guests happy and we have many return visitors. See our reviews and come enjoy the most famous small town in the world! When you're living in the mountains, you should have a mountain view, and we have the BEST! In summer you need a pool and we have that too!! We are not absentee cater to your every need and have a groundskeeper and maids who take pride in their work. No mold or mildew here! Clean, neat and beautiful. See our reviews! Book early or leave a deposit for your special dates to secure them, as our calendar changes daily! You can now book your dates immediately with the newest "BOOK IT NOW BUTTON" . This property is magical. It has been in our family for many years and you will enjoy it's many wonderful features. When was the last time you took a walk and saw a pair of amazing owls staring down at sunset moon of serenity. Pets: please ask! 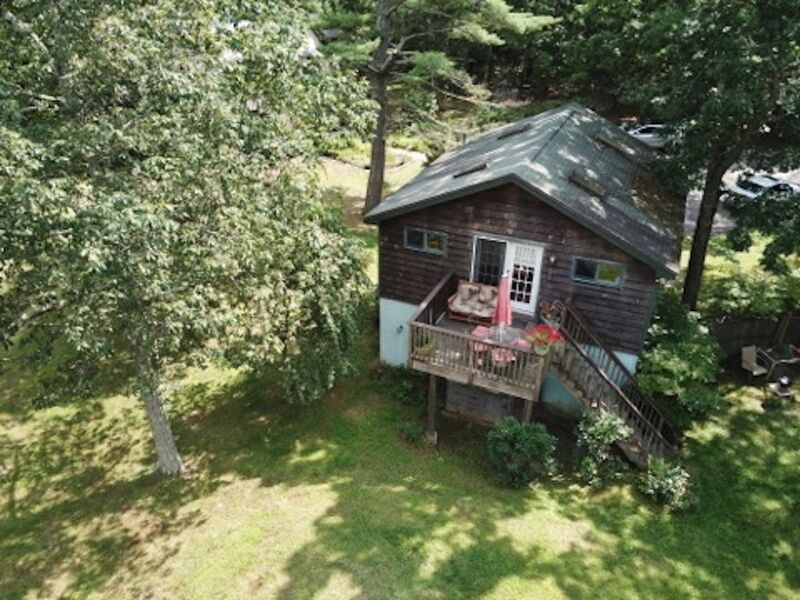 Sited on ten private acres yet only one mile from Woodstock Village. Pool in summer, cross country ski in the winter. Fall is AMAZING and full of color and amazing hiking & biking trails. Come find serenity & peace with our majestic views of the Catskill Mountains from your house. PEAK leaf season for color is Columbus Day Weekend. (3 night minimum stay that weekend). We also cater to birthdays, anniversaries, and all holidays : Thanksgiving,Christmas, New Years, Valentine's Day, Spring break, Easter, Passover, etc. BOOK early for holidiays and summer. tile bathroom, shower, towels supplied. 10 gorgeous acres mountain top just 3 minutes drive to the town of Woodstock. Amazing views....private large deck that overlooks the Catskills and pool in season. many amazing places to see and things to do. We have lots of brochures for you, we are also available if you need information about where to go, what to do and see....just ask! cross country only here....but ski slopes Bellyre and Hunter are close and Woodstock is a charming place to stay for skiers. Peaceful and a lovely little town. overlooks the inground pool and mountain views and is incredibly beautiful in all seasons of the year. cell service is available here on top of the mountain. Many areas in Woodstock DO NOT have cell service. 4 dining seats inside and 4 out on the deck for summer dining overlooking the mountains. there is a video store in the town of Woodstock very close. close to Hunter and Bellayre Skiing & Snowboarding. Sunset Studio has many return guests. We are located in a beautiful spot on top of the mountain on 10 magnificent acres. If you love the mountains, fresh air, and nature you will enjoy it here. The bonus is that the studio is only 3 minutes from town where there are many wonderful shops, restaurants, galleries, flea market, farmers market, Animal Sanctuary, Buddhist Monestary, Levon Helm's Barn Music Venue, Bearsville Theater for Music, The Woodstock Playhouse to name a few! In Woodstock NY, the most famous small town in the world. Galleries, Live Music, history, museum, art colony, movie theater, largest authentic Buddhist Monestery in the US. , world class restaurants, shopping, flea market, Sun. drum circle, Woodstock Playhouse, home of the annual Woodstock Film Festival ( OCT), Luthiers show, and home of the Levon Helm Rambles--Keep it Going concerts, Bearsville Theater (music venue), Upstate Films movie theater, hiking and biking trails, swimming, canoeing, tubing and many ski areas, as well as several great ice skating rinks nearby in the winter months.